Moura is the thirteenth month and the fifth season of the Sacred Year of Our Mother God. Unlike the other seasons, which each consist of three 28-day months, Moura is a single-month season. While the other seasons correspond to the four "material" elements, Moura corresponds to the fifth element (literally, the quintessence), Aethyr. Moura is sometimes called "the Filianic Lent", and this is certainly not an inaccurate description, since it is the period of purification that precedes the death and resurrection of the Daughter. It is a time of discipline and sacrifice, of cleansing and purification on all levels. Interestingly, the (long pre-Christian) name of February, the secular month in which Moura begins, means "the month of purifications". The word "Lent" was actually the Old English name for the season of Spring, and while Filianists regard Moura as a separate season, neither Winter nor Spring, the tradition of "Spring cleaning" in Filianic households actually takes place in Moura. It is cleaning for Spring rather than in Spring. And cleaning for Spring means specifically cleaning for the first day of Spring, which is also the first day of the year, and the day of the Daughter's resurrection. Thus Spring cleaning and Moura purifications are all part of the same thing. By making personal sacrifices and undertaking disciplines, we are purifying and preparing our souls and bodies for the New Year and the Resurrection. By cleaning the house – which is always a microcosm of the world and of the body – we are doing the same thing on another level. The household, or hestia, is particularly important in feminine faith and tradition, so what is happening is that, while on the cosmic level the Daughter, by Her sacrifice, renews the cosmos, we renew the microcosmos, both of ourselves and of the hestia. So, while on one level the disciplines of Moura are seen (as such things tend to be seen in the Christian West) on a moral and personal level, they should also be seen on the level of ritual action, as participating in the Cosmic Drama which is embodied in the Wheel of the Year. It is interesting to note here that the word karma is currently used in the West to mean the law of action-and-reaction on a purely personal level, considered quasi "moral" in nature, while in traditional Vedic usage, it also means ritual action (which is seen as the quintessential form of human action). As you see, the two levels of karmic activity are united in our Moura purifications. Karma is usually translated in Filianic terms as werdë, which is close to the lesser, and western, sense of karma. Werdë is said to be the daughter of Thamë who is the Angel of the essential harmony of the Cosmic Drama and also rules human ritual participation in it. Throughout the year, we should be participating ritually in the Sacred Drama, but we are fallen beings and our life naturally falls away from the highest, not only through our personal failings, but as a result of the natural centrifugal pull of Kali Yuga. 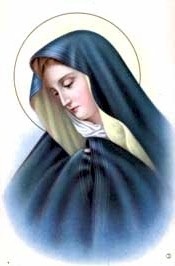 Moura is a time of consciously negating that pull, purifying ourselves of the worldly accretions of the past year and readying ourselves for a new start, that we may live and be reborn in Our Lady. Of course, our Moura disciplines are little more than tokens, but they are important tokens that help to align our will with the Will of Dea. In the end, the rebirth we experience at Eastre and the wonderful renewal of our life at the New Year (and we know of no tradition in which this powerfully personal sense of renewal with the year is so profound as in the Filianic faith) is brought about by Dea Herself, and by the perfect Sacrifice of the Daughter, not by our small actions. Only so far as You are acting through me. Our Moura disciplines are simply the enactment of willingness and surrender that allows Dea to Act in us. In a certain sense, Moura is a "time out of time" – the fifth of four (seasons), and the thirteenth of twelve (months). It is the exception to worldly rules. This "exceptionality" of Moura is also expressed in its directional symbolism. While the four seasons correspond to the four cardinal horizontal directions, Moura exists literally in a different dimension, the vertical. The vertical dimension, in relation to the horizontal world, refers to that which lies either "above" or "below" it – to Heaven and the spiritual worlds, and also to the dark lower regions of being. In Moura we use our human power of choice to transcend our worldly nature, rising above the material plane, but also it is on the last day of Moura that Our Lady descends below the world into "the nethermost regions and the regions of death." The true "time out of time" comes immediately after Moura, on the Day that Has No Date – the Hiatus between the end of the old year and the beginning of the new, when the Daughter hangs slain upon the World Pillar. Moura leads us and prepares us, toward Her death and that terrible day without Her, and the threefold Rebirth that will follow it – of the Daughter, of the world, and of ourselves. Moura Eve – Brighe 28th/February 19th: Pre-Moura feasting. The Filianic "Mardi Gras". Moura Day – Moura 1st/February 20th: The first day of Moura. Kept by some as a full fast. Med Moura – Moura 14th/March 5th (4th on leap years): A break from Moura abstinence and discipline. Feast day and also a day for celebrating mothers and spiritual or art-mistresses. 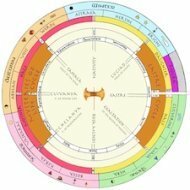 Kala – Moura 28th/March 19th (18th on leap years): Last day of the year, first day of Eastre. The Day of the Death of Our Lady.